Bali Restaurant It can be the best place to try babi guling. 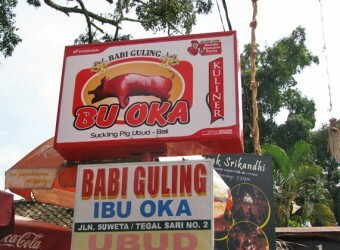 Ibu Oka's babi guling is said the best roast suckling pig on Bali. Pork meat accompanied by some pieces of crispy skin and is served with rice and a sauce of spices and some green vegetables. You have to go early to avoid the queues and crowds, also to ensure that not only to be told that babi guling is sold out.